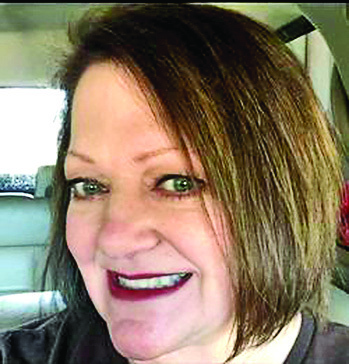 Memorial services for Paula Windham Geoghagan will be Saturday, Sept. 16 at 11 a. m. at First United Methodist Church in Natchitoches, the Reverend Doug de Graffenried officiating. The family will receive friends from 10 a. m. until service time. Paula Geoghagan, 50, passed away Sept. 7, 2017. She was born May 15, 1967, in Shreveport. Paula graduated from Natchitoches Central High School. She was an NSU graduate with a degree in English with a minor in math. She was also a member of the NSU Marching Band where she was on the flag line and played percussion instruments. Paula was the business administrator at First United Methodist Church. She is survived by her husband, Freddie Geoghagan; her children, Ian and Gavin Carrasquillo; her mother, Beth Windham all of Natchitoches; her sister Shannon Oberle and her husband Mark of Madison, Miss. ; nephews Austin and Braden Oberle; grandmother Ethelene Bright; aunts and uncles Rhonda and Lee Kuhlmann and Sarah Lou and Tommy Maines; father and mother-in-law Marvin and Pat Geoghagan. She was preceded in death by her father Leslie Windham; grandparents Sid Bright Jr., Martene and Bobbie Windham and great- grandmother, Iliene St. Andre. In lieu of flowers, donations may be made to the First United Methodist Church in Natchitoches.